Exit the cluttered Victorian doll’s house of our parents, and the austere prefabrication of post-war days. 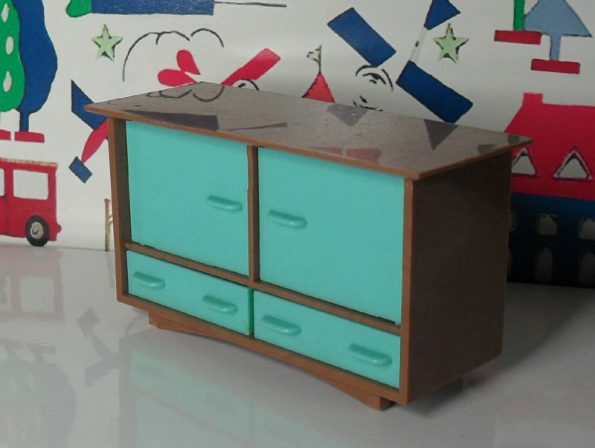 Here at last is a doll’s dream of stylish living. 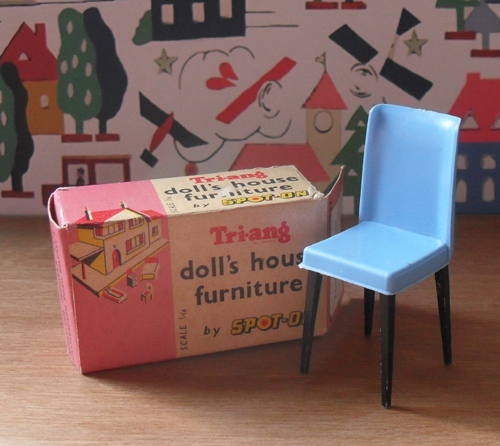 Shown here is Tri-ang’s delightful colour combination in an up-to-the-minute doll’s dining suite. Contrasting sideboard and draw-leaf dining table are enhanced by the graceful upholstery of dining chairs. All of these are expertly carried out in zinc weighed injection moulded plastic. 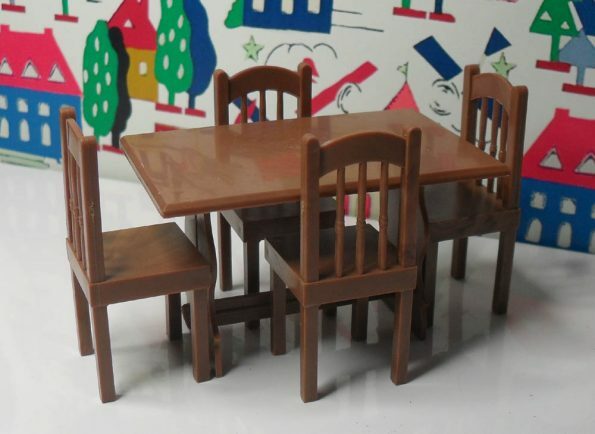 This G Plan dining table has a section in the middle, and the table slides together making it smaller. 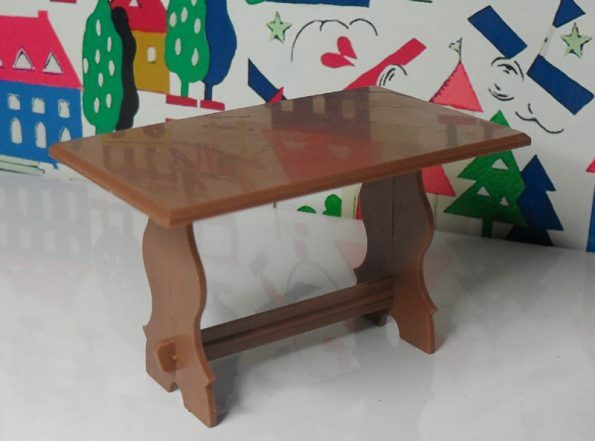 The plastic top is made to represent walnut, and has a metal black frame and legs. With the introduction of the new Jenny’s Home range, the out dated dining room table and chairs was replaced with a more traditional look. 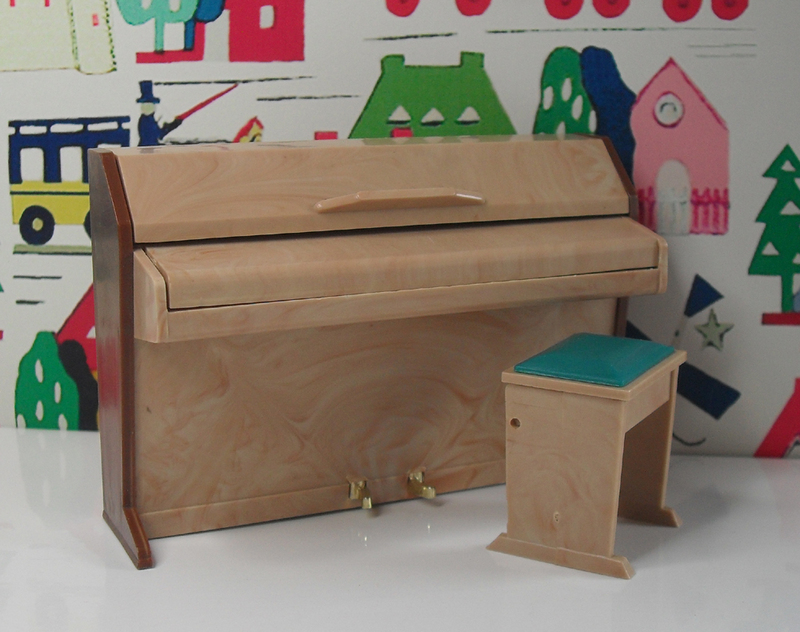 Now made completely of brown moulded plastic, to represent wood. These chairs come in various colours, red, pink, light blue, purple and cream, all have metal legs. 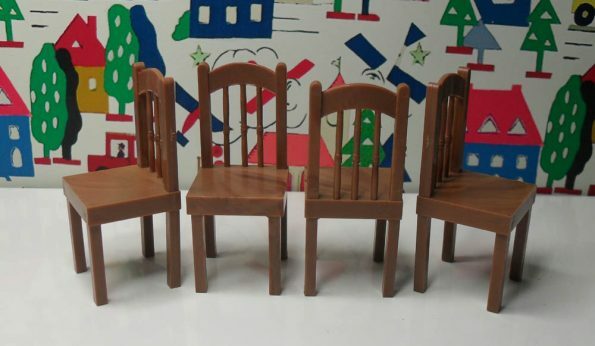 You can see from the picture above that the middle chair has thicker legs than the others, making this a later model. The moulded plastic seat is meant to represent leather. They came in various colours. The Triang boxes are a very tight fit, so it is surprising that many survived at all. 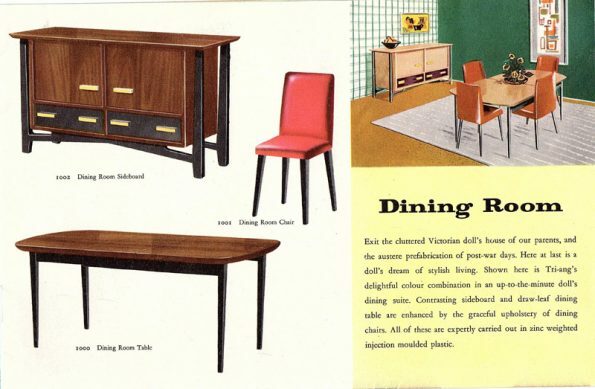 Notice the legs on the red dining room chair are not so pointed as the earlier ones. Exit the cluttered Victorian doll’s house of our parents, and the austere prefabrication of post-war days. 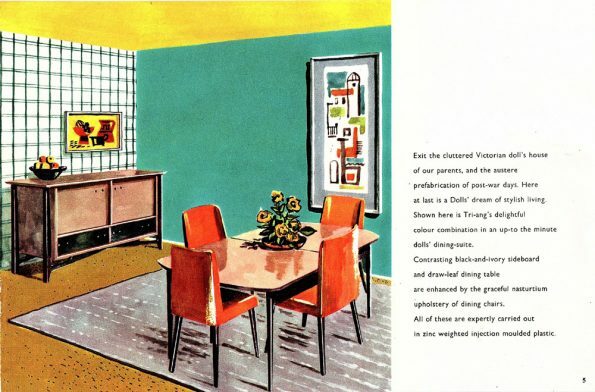 Here at last is a Dolls’ dream of stylish living. Shown here is Tri-ang’s delightful colour combination in an up-to the minute dolls’ dining-suite. Contrasting black-and-ivory sideboard and draw-leaf dining table are enhanced by the graceful nasturtium upholstery of dining chairs. All of these are expertly carried out in zinc weighted injection moulded plastic. Jenny’s Home range Dining Room chairs, replaced the Triang chairs 1001, a simplier more modern style. The dangerous pointed metal legs were now a thing of the past. 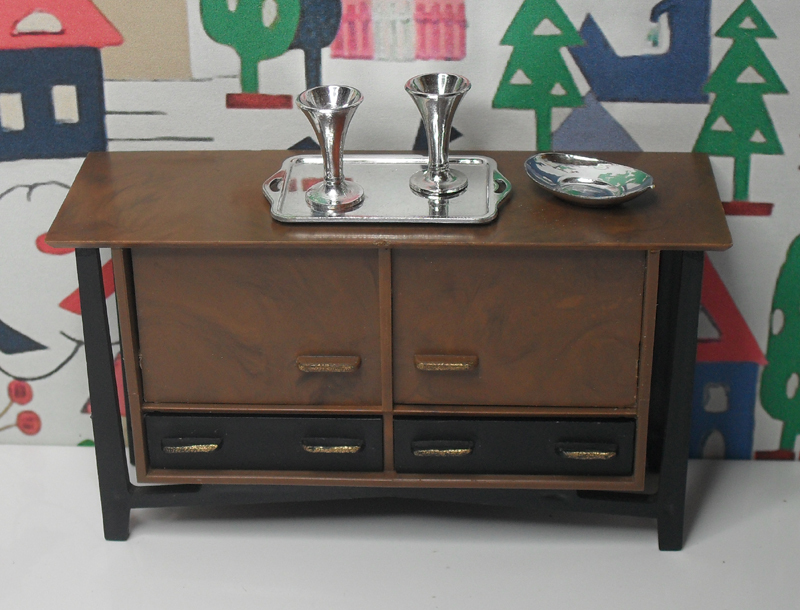 Sideboard 1002 with silver tea tray 1112, vases and bowl. 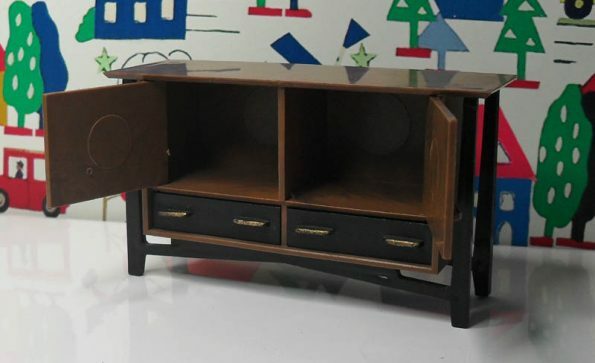 This sideboard was a reflection of furniture of the period based on G Plan range. 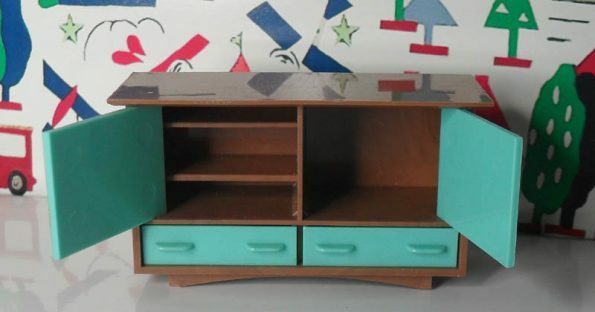 The doors and drawers on the Sideboard open. 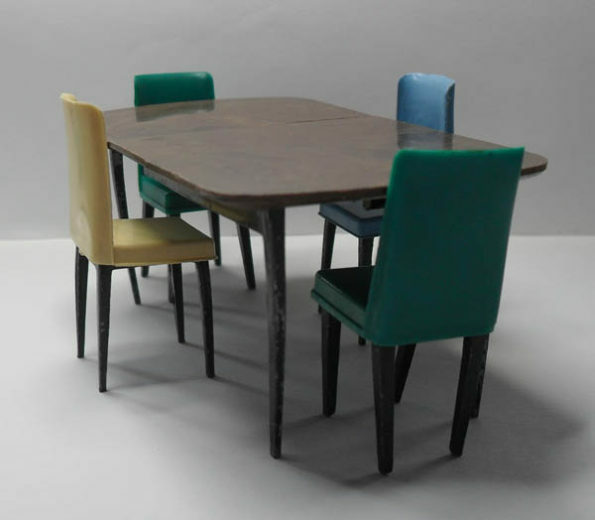 This piece carried on into the Jenny’s range of furniture with the black frame-work changing from metal to plastic. It is amazing that the dining room consists of just three pieces of furniture, although the chairs did come in lots of colours. I suppose you bought chairs singly depending on the size of your family!